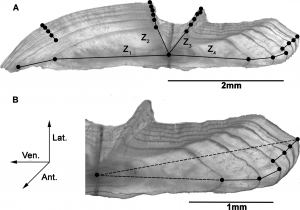 Cross-sections of the left sagittal otolith from a six-year-old S. aurata individual caught in May 2002. Grantham Supervisor Dylan Childs has co-authored a paper, ‘Using an integral projection model to assess the effect of temperature on the growth of gilthead seabream Sparus’. We investigated how increasing summer temperatures affect the growth of gilthead seabream (Sparus aurata). Our analysis indicates that warming will have a significant impact on S. aurata size-at-age, with important implications for stock assessment and management of this commercially important species.